These boxers are from Aubade's first expedition into menswear, and it is just as you might expect from Paris' foremost designer of lingerie, a fantastic range. These boxers are designed to stand up to wear after wear, whilst being stylish too. That is thanks to these boxers being made from modal. 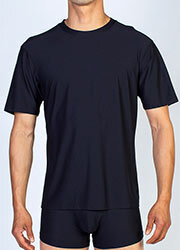 Modal is a type of cotton, and it is one of the comfiest and most robust fabrics in the world of clothing design. This pack contains two items, one plain in a classic white, the other a powerful floral print that is a real eye catcher.